Every time I'm at Target and I walk past the Converse sneakers, my hands shake. I can't handle seeing boring white shoes. Canvas shoes. I couldn't take the craving, I had to get my fix! 1. Remove the shoe laces, color them black. 2. 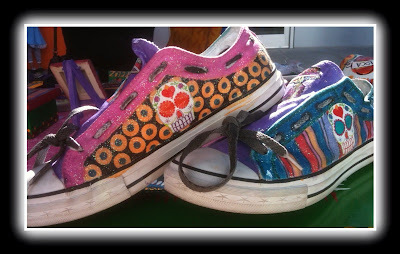 Color the shoes (and the tongue) with the markers and/or paints. Let dry. 3. Use the Collage Pauge Sparkles to affix the images from the Crafty Chica Mojito papers. 4. Create holes around the top of the shoe all the way around. 5. Thread the shoes laces around all the holes. 6. Coat the shoes with Collage Pauge Sparkles. Let dry.